Robert Cocking (1776-1837) was a pioneer parachutist and artist who lived between Kennington and Stockwell. Charles Dickens’ friend Robert Morley was tutored by him as a boy.1 Cocking’s house, he wrote, “stood in a little garden in one of the side roads between Kennington and Stockwell.” Cocking was “short, round, and pleasantly untidy”, and much loved by his young students. He was a good landscape painter but he made additional money by drawing flower designs for the packaging on cosmetic products, apparently in order to support his wife and the two aged female relatives who lived with him. Cocking was something of a monomaniac, however, clearly obsessed with balloons, and his house was filled with his drawings of them. “After his death they were sold,” wrote Morley “and whoever possesses them now possesses true labours of love. For, certain it is that he drew balloons because he loved them, and delicately stroked with the sepia over their fat sides, as a lover strokes the curls of his mistress.” Living where he did, he could clearly see balloons ascending from Vauxhall Gardens and Surrey Zoological Gardens. Thirty-five years before his dramatic death, Cocking had witnessed the dangerous descent of André-Jacques Garnérin, who made the first parachute jump in England. During his descent, Garnérin’s parachute had oscillated dangerously and Cocking was convinced that he could improve on the design. He came up with shape similar to “an inverted shade of a reading lamp,” 107 feet in circumference and connected by three hoops. Then he asked his idol, the famous balloonist Charles Green, if he could make a descent from his balloon the Royal Nassau at Vauxhall Gardens. Green assented and Cocking’s parachute test was advertised as the main attraction of a fete day. Cocking was convinced there was no risk. He went over the calculations again and again and made several scale models, which he tested on Hampstead Heath and at the Monument, where his 1-in-12 model descended “in a faultless manner”. I saw the balloon, with the parachute attached, go up into the summer evening air; saw the poor fellow wave his last adieu to this world; wished that he had not rashly floated so far and gone so high before he detached himself; and then saw him descend in wreck, so instant, that the pulling of the trigger of a pistol pointed to his brain could not have seemed to slay him more immediately. Cocking was in a basket below the parachute which was suspended from the basket of the the Royal Nassau, which was piloted by Green and Edward Spencer. 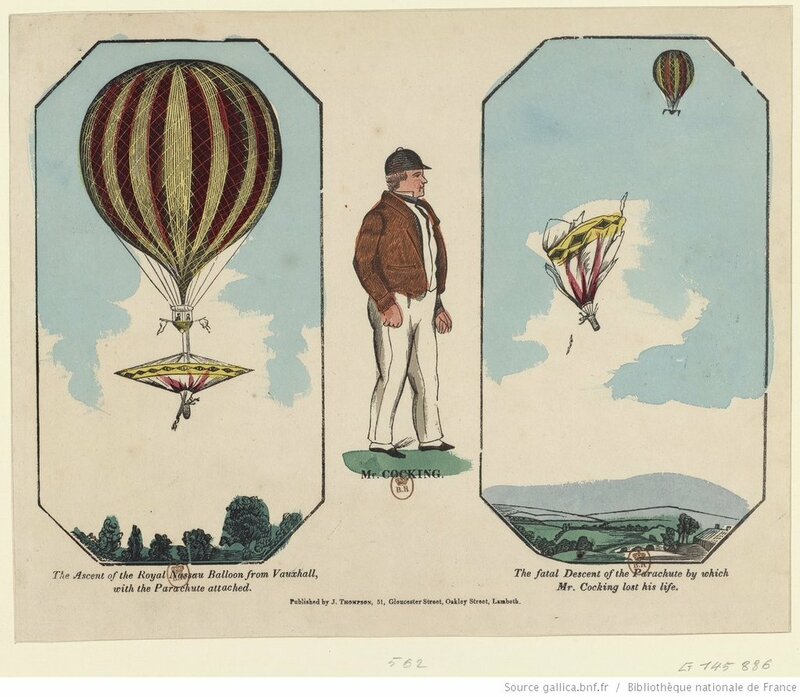 But the weight of the balloon and of the parachute, as well as of the three men, slowed the ascent, which attained only 5,000 feet by the time it was over Greenwich (it should have got to 8,000). Living close to them, I was where the essential thing, the perilous descent, could be seen in its whole course from a terrace on the house-top, undisturbed by crowds, and with nothing whatever to impede the view. I turned my eyes from the sight of that thing like a dull drunken day-meteor tumbling swiftly and unsteadily to earth with a friend’s life at the heart of it thus visibly coming to its end. The parachute fell at Lee, eight miles to the south-east of Vauxhall, where thieves stole the remains of Cocking’s parachute, as well as his purse, watch, snuff box, eye glass, shoes, cap and the buttons from his coat. A local publican charged people sixpence to view Cocking’s mangled body. Later, the eminent scientist Michael Faraday (who was born in Newington Butts) wrote to a newspaper to say that he was acquainted with Cocking through their membership of the Philosophical Society, and that he had been at Vauxhall Gardens for the ascent. Cocking had asked his opinion on the safety of the parachute but he was unable to reply without making detailed calculations. He did remark on the weakness of the construction, however, and this was one of the faults found by the inquest into his death. Household Words, Vol 4, page 97.